Following the death of Tataka and her sons Mareecha and Suvahu, Viswamitra’s sacrifice is completed without further interruptions. 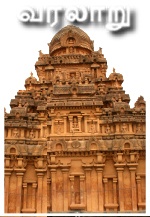 The Sage then takes the duo to the nearby city of Mithila, ruled by King Janaka. On the outskirts of Mithila, Rama cites a dilapidated hermitage. Upon enquiry, he learns that it was once the abode of Sage Gautama and his unfortunate wife Ahalya – who fell for the deceit of Indra and was eventually petrified into a Stone. At the touch of Rama’s feet, Ahalya curse is relieved and she retains her human form. These events are portrayed at Kumbakonam [Panels 10 & 11] and Pullamangai [Panels 14 & 15]. The sacrificial alter is seen in the middle of the panel. A young priest is sitting to the left of alter and is involved in raising fire and conducting the Yagna. He is being assisted by another person standing right behind him. Sage Viswamitra, who is also standing to the left of alter is seen in conversation with Rama. His raised right hand showing Vismaya Mudra suggests that he is stressing the importance and significance of the sacrifice in progress. Rama, standing to the right of alter with Lakshmana, is listening to Sage in full attention. His head is slightly raised so that he is in eye to eye contact with the Sage. It is noteworthy that in Pullamangai, the attack of Mareecha happens when the sacrifice is in progress [Panel 12] whereas at Kumbakonam the sacrifice seems to have progressed only after the daemons were driven away. 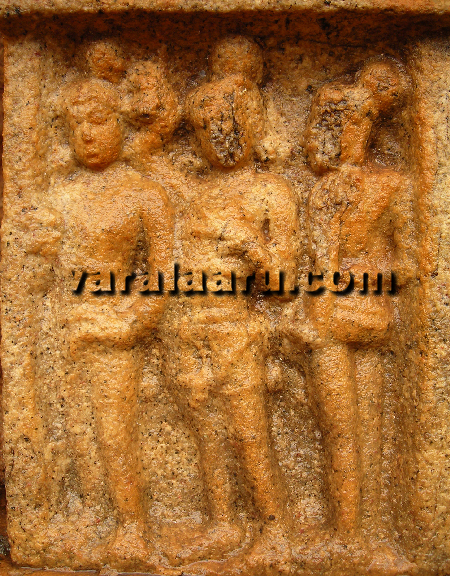 Also, the injury and fall of Rama at Pullamangai [Panel 13] is not seen at Kumbakonam. The theme of this panel is unique and is only available at Pullamangai. The event portrayed here is derived by connecting it with the next Panel [No. 15]. Since these two panels are located on either side of the northern Devakoshta [housing a standing Brahma], we may surmise that the events portrayed are related to each other. Three figures are seen in the panel. All of them are looking towards the right. The first figure is calm and composed, gesturing Kataka mudra in right hand and holding his left palm on his thighs in Katiyavalambita posture. This could be Lakshmana. The figure in the middle is talking. His left hand gesturing Ala Padma suggests enquiry and question. It is obvious that he is curiously enquiring about something he is seeing in front of his eyes. His left hand is decoratively holding a bow. This could be Rama. The third figure standing behind Rama is turned in a slightly different direction. This could be Viswamitra. Together, this panel might represent the trio witnessing the plight of Gautama’s hermitage and Rama enquiring about the same to Viswamitra. The panel shows Rama placing his right foot on the stone. His dwibhanga posture is very peculiar. It suggests humility and kindness on the part of Rama in relieving the curse of a respected Rishi Patni. 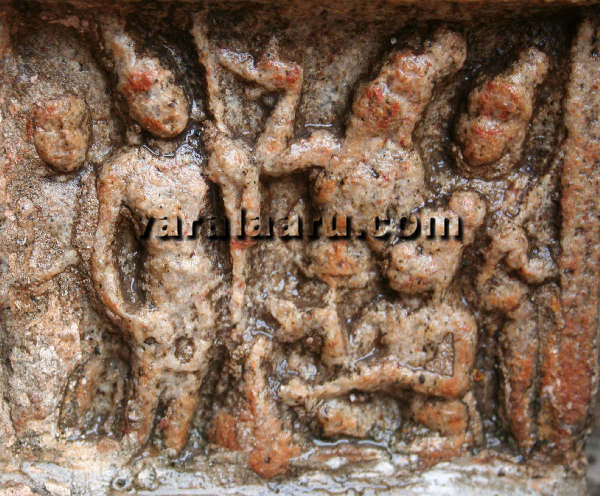 Lakshmana’s bent head compensates that of Rama. Ahalya, who is seen to the left of the spectator, is still in the process of being relieved – part of her body is still a stone block. She is rising with clasped hands showing Anjali Mudra, full of gratitude and compassion. 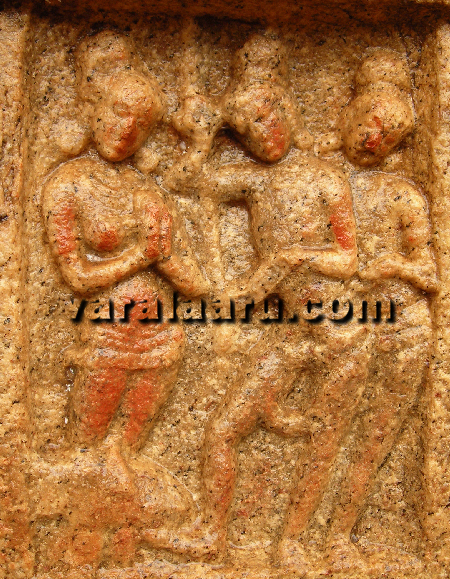 It is noteworthy that Ahalya being cursed and petrified into a stone is peculiar to southern recensions of Ramayana. In the north Indian versions, Ahalya is cursed to be invisible without food or hunger for a thousand years! Kambar follows the southern tradition. While the Pullamangai panel shows Ahalya in the process of being relieved, Kumbakonam captures the moment after the curse is fully lifted. 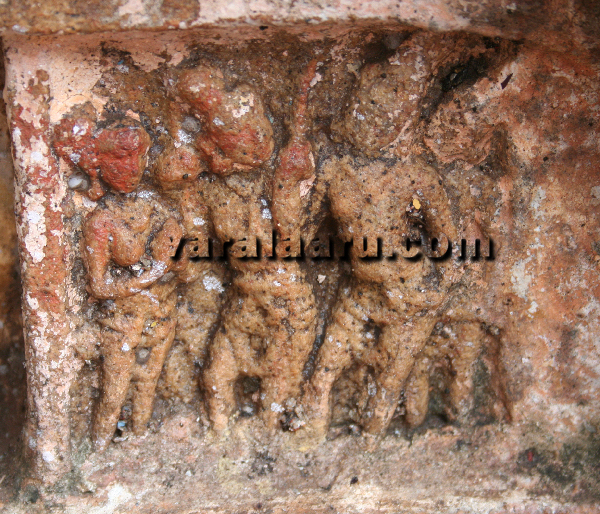 The bottom portion of the panel is covered with concrete – so it is difficult to confirm if Ahalya was cursed into a stone or otherwise. Rama is standing in the middle of the panel and looking at the relieved Ahalya. His right hand is holding the bow and the left hand is held in thighs in Katiyavalambita. His posture exhibits confidence and composure – but the consideration for Ahalya [Karuna] so well expressed at Pullamangai is missing. The figure standing behind Rama is worn out; this could be Sage Viswamitra. Ahalya is seen at the extreme right of the panel. She is standing with clasped hands in Anjali hasta. Her posture is rigid; the natural happiness and gratitude seen at Pullamangai is missing.